Friendship becomes rivalry and the quest for fame becomes obsession in this virile epic produced in part by Ridley Scott and featuring gripping portrayals by Brad Pitt (winner of the Venice Film Festival Best Actor Award) as Jesse and Casey Affleck as the youth drawn closer to his goal ... and farther from his own humanity. $147.812 thousand on 5 screens. It may not have won any Oscars, but if nothing else, The Assassination of Jesse James By the Coward Robert Ford takes home the prize as 2007’s Longest Title. This flick takes us back to 1881 to meet the legendary Jesse James (Brad Pitt). Jesse and his brother Frank (Sam Shepard) run a band of thieves called the James Gang. Of the original crew, only Jesse and Frank remain, so they have to gather counterparts from locals. Into this posse steps Robert Ford (Casey Affleck), a 19-year-old with aspirations to grandeur who worships Jesse as his idol. He feels he’s destined for great things and just wants the chance to prove himself. Frank takes an instant disliking to the boy, but the “gregarious” Jesse allows him to come along on a train robbery. After that, he lets Ford act as his assistant for a while, a move that further fosters the boy’s fantasies. However, these grand feelings don’t last. As the story proceeds, Ford sees a darker side to James and begins to fear for his personal safety. He also discerns cruelty from an increasingly paranoid, suspicious James. The movie follows related threads as it leads toward its titular conclusion. And the fact that the film’s title tells us exactly how it will end creates something of a challenge. As with flicks like Titanic or The Hindenberg, Coward lives or dies based on how well it relates a tale for which we already know the conclusion. Obviously it can’t rely on a surprising ending, so the pleasure involved must come from the manner in which the filmmakers develop events. In this case, I think they do so quite well. Granted, Coward won’t endear itself to the impatient. Not only does it run nearly three hours, but also it moves at a rather deliberate pace. Essentially all of its action comes during the first act’s train robbery. After that it becomes much more of a character piece that examines the various relationships and motives. Since we usually expect rip-roaring action from Westerns, the film’s style can take adjustment. However, Coward deserves the effort. Once the viewer settles in and accepts the film’s pace, it becomes an engrossing effort. Indeed, it succeeds because it takes its own sweet time and doesn’t indulge in any shortcuts. Coward wants to paint reasonably complete psychological portraits of James and Ford, and in that domain, it works. These become “warts and all” portrayals that don’t focus on stereotypical personality traits. James goes from loving family man and good citizen to cold-blooded psychopath with ease, and the transition feels natural; we fully buy both sides of the character. It helps that Pitt plays James with both enough melancholy and bravado to make us believe him. Affleck also does nicely as the torn Ford. On one hand, he remains the idol-worshiping follower of James, but he also displays the ways in which Ford tries to grow up and become his own man. Affleck brings out the character’s inner conflicts and turns Ford into a compelling personality. Coward doesn’t try to tell us what to think. It’s the three-dimensional nature of its characters that allow that flexibility. Just because the film uses the word “coward” in its title doesn’t mean we’re meant to view Ford in that manner. We get a good picture of all sides in this dramatic rendering of a sad tale. 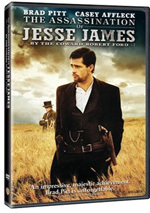 The Assassination of Jesse James By the Coward Robert Ford appears in an aspect ratio of approximately 2.35:1 on this single-sided, double-layered DVD; the image has been enhanced for 16X9 televisions. Across the board, this was a fine transfer. Even with all its wide western vistas, sharpness remained strong. Barely any signs of softness ever emerged. The movie stayed tight and well-defined from start to finish. No issues with jagged edges or shimmering materialized, and edge enhancement remained minimal. Source flaws also failed to crop up at any point. Westerns don’t lend themselves to broad color choices, and the palette of Coward stayed suitably subdued. The emphasis was on a quiet sepia tone with virtually no instances of bright, dynamic tones. Within these constraints, the hues looked fine. Blacks were very deep and firm, and shadows showed positive delineation. I found a lot to like in this excellent presentation. As for the Dolby Digital 5.1 soundtrack of Coward, it suited the material. Like I mentioned in the body of the review, the film didn’t feature too many big action pieces. The train robbery early in the flick provided its most involving sequence, as it brought out the gunfire and other elements well. Otherwise, this was a quiet effort. A few other gunshots used the spectrum in a positive way, and general environment seemed realistic. Music showed good stereo delineation, and a little localized speech also appeared. Nonetheless, most of the time this track stayed low-key. Audio quality satisfied. Speech always seemed warm and natural, and the gentle score showed fine clarity and definition. Effects were concise and accurate throughout the movie, and the smattering of louder bits lacked distortion. This never became a supercharged track, but it didn’t need to be like that. Virtually no extras appear here. At the disc’s start, we get clips for One Missed Call, 10,000 BC, The Brave One, and Bury My Heart at Wounded Knee. And that’s it! No trailer for Assassination - or any other supplements – show up on the DVD. The absence of extras disappoints, but the movie succeeds. The Assassination of Jesse James By the Coward Robert Ford gives us an intricate and thoughtful examination of historical events and characters supported well by some excellent performances. The DVD offers terrific picture quality and very good sound, but it does lack supplements. That makes it less than exciting as a release, but I think the movie’s strong enough to warrant a look.